Safe Passage has shanghaied me. The minute I finished, I was ready for a second reading. I want to send it to friends who live life with ferocious passion. Or passionate ferocity. The ones who dream, who wonder, who say, “what if?” Visionaries who can execute a plan. Friends for whom zest is more than a lemon. Forget Thelma and Louise. Ida and Louise will bowl you over. The book covers three periods in the life of British spinster sisters. Each one, alone, would make a dazzling book. The first period (1923-1936) paints their love of opera and initial friendships with opera celebrities. The second season (1937-1939) narrates their travels to Germany almost every weekend under the guise of going to the opera in order to facilitate emigration for desperate refugees. The third act (1939 -1950) gives a remarkable account of life in London during the Blitz and post-war operatic adventures. You don’t have to know, understand or even like opera to enjoy this book. Because the remarkable thing is how two typical office workers making £2 – £3 a week saved £100 each to travel to New York to see an opera. and sacrifice. All our thoughts were concentrated on how we could do it. First Louise bought a gramophone and ten records. When Amelita Galli-Curci made her English debut, Ida and Louise skipped lunches, scrimped to buy tickets. They discovered opera. Galli-Curci, their favorite soprano, only sang opera in America. It was simple: if they wanted to hear her in an opera, they must travel to New York. (I get this: I flew to Chicago to hear Yo-Yo Ma play the cello; our family and friends drove six hours through an epic snowstorm to hear blues singer-songwriter Eric Bibb.) Without telling anyone, the Cook sisters sketched a budget and systematically saved £1/week. They continued to attend operas, queuing on camp stools for up to 24 hours in order to get cheap seats in the gallery. Rarely are such exacting frugality and such exuberant extravagance found in one personality. achieve by your own effort and your own sacrifice do have a special flavour. They did something wonderfully naive: they told Galli-Curci their plan. She was delighted, offered tickets and asked them to look her up in New York. Thus began the first of many close friendships with the celebrities of the day. The Sisters Cook were commoners, plain British women (think Susan Boyle…before). Yet their enthusiasm, their untrammeled joy must have been attractive, as evidenced by their host of friends. Ida began writing romance novels to finance their opera habit. A trip to Verona followed a trip to Florence; they traveled to Salzburg then to Amsterdam to see Strauss conduct. Through their friendship with opera stars they became acquainted with Jews looking for an escape from the Nuremberg Laws. not have thought we had anything to spare. For an German adult to emigrate to the safety of England, a British citizen had to guarantee financial responsibility for life for the emigrant. After Ida and Louise exhausted their resources, Ida took any public speaking invitation to inform people of the urgent need for sponsors. Ida bought a flat in London for transitional housing for the refugees; the sisters continued to live with at home with their parents. The sisters’ efforts secured safety for twenty-nine people. When September 1939 arrived, their refugee work was over. What follows is an extraordinary account of life during the Blitz. An entire city worked during the day and slept in underground shelters at night. breathed from the farthest, shadowy corner. believe in God and make themselves miserable. 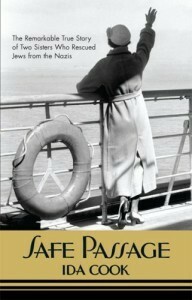 Safe Passage is part Julia Child (if she took to opera like she did to cooking), part Oskar Schindler. This entry was posted in Uncategorized and tagged bookreview, ww2 by alivingpencil. Bookmark the permalink. I’m hooked! Going off to see if I can find a copy! Thanks for the review, Carol. I’ve placed this book on hold at my library. Speaking of books…the wonderful book I won arrived (How the other Half LIves) a few weeks back. The first person to nab it was my daughter who took one look and said “Wow, I’ve heard about that book and I’ve wanted to read it.”. So there ya have it!! I apologize for being so slow…It arrived as we were leaving town one day and I grabbed it out of the mailbox as we left. Thanks so much for having a drawing….it’s good fun and the winning book was greatly appreciated! Looks like another book I’ll need to add to my library list here..
Wow! This must be some book! I’ll have to check this one out of our library. Thanks for telling us about this one.I’m adding you to my blog roll! @Judy Dudley – Hi Judy! Thanks for stopping by and for your friendly comments.